Lee dies are machinehoned to the smoothest possible finish. These dies produce factorydimensioned ammo that reliably fits and feeds in any gun. 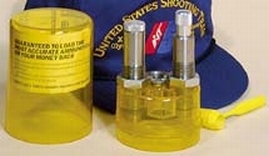 Lees Pacesetter 3Die Set includes Full Length Sizing Die Bullet Seating Die Powder Through Expanding Die Universal Shell Holder Powder Dipper Load Data and Instructions. These models do not include the Factory Crimp Die. Note 4570 dies SS 40377 do not work on Hornady LEVERevolution cases.